Brown melamine over wood with brushed brass. Very rare, very elegant and wonderful lines. Signed on top with ph jean. Table lamp from the same collector’s estate also available. Philippe Jean was an French artist who started as sculptor and began to create manly lights and only a few pieces of furniture. He exhibited at the Salon des Ateliers d'Art et Creation in Paris and at the Salon du Luminaire in Paris and also at Euroluce in Milano and the Frankfurter Messe. He won various prizes for his works. 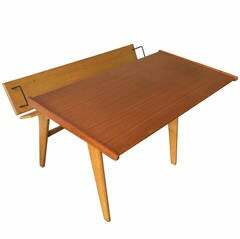 We are very happy to offer this outstanding and early piece of furniture. This table remind us to Gabriella Crespi. 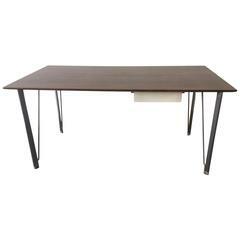 Rare Arne Jacobsen desk designed in 1955. Wonderful grain. Very nice desk with two drawers and bookshelf. Base in oak and tabletop in teakwood. Very elegant shape.